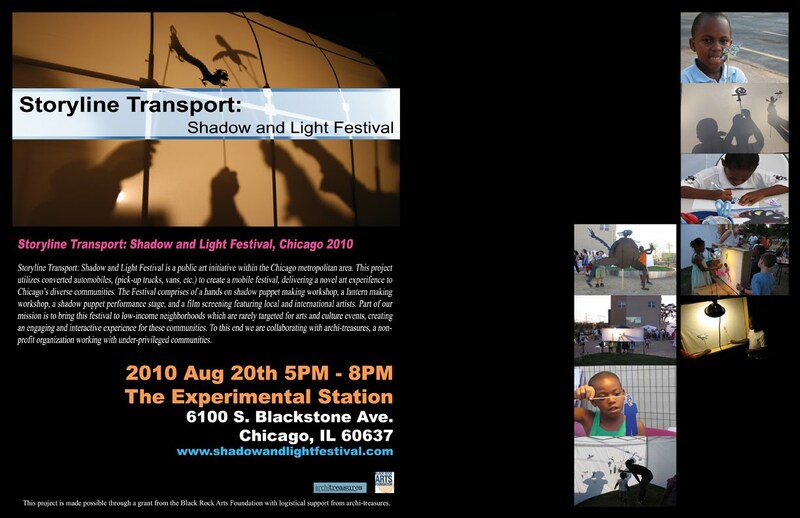 One of our 2010 grant recipients, Storyline Transports: Shadow and Light Festival, is a traveling festival bringing hands-on shadow puppet and lantern makingworkshops, a shadow puppet performance stage, and curated videoscreenings to neighborhoods in the Chicago metropolitan area, during weekends this month. In collaboration with architreasures, an arts-based community development organization, the festival targets children and adults of all ages in under-served communities throughout Chicago. Storyline Transports is seeking Volunteers! Get involved with this great project! Come be a part of this exciting festival, learn shadow puppet-making skills and teach them to kids! The festival is needs of volunteers to help with running workshops and with set-up and tear down of the mobile festival. If you are interested in volunteering or have any questions, pleaseemail David Prince at wooleeprince	@gmail.com (wooleeprince	@gmail.com) .